Ros and Josh Hannam's daughter Lola was diagnosed shortly after she was born. Mrs Hannam said people found it "ridiculous" when she told them they had to pay. The Welsh Government said it would review BSL funding. "I think the first thing we felt [after Lola was diagnosed] was probably devastation," Mrs Hannam said. "She was going to have extra requirements and extra needs that we weren't anticipating. "I think once we got over the initial devastation, it was about what can we do to make this good?" The couple got some basic language support through the council's Sensory Communication Service, but how much parents have to pay towards BSL classes depends on where they live. Mrs Hannam said: "I was pretty taken aback. If we say to someone we have to fund it ourselves, the general reaction is 'What? That's ridiculous'. "Nobody can afford that kind of money and I think that's how we felt as well. 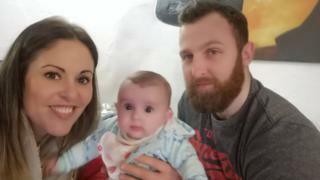 "I'm spending most of my time trying to organise, trying to raise funds, organise raffle prizes just to be able to communicate with my daughter." Jade Kilduff, who is campaigning for basic sign language to be compulsory in schools, said she supports Mr and Mrs Hannam's campaign. Jade said: "My wish is that one day everyone knows just the basic signs at least. "I'd hate a world for him [Christian] where only a select few people knew enough signs to be able to understand him, that must be so isolating. "I am determined to make a change and to make the world a better place for my brother and other children and adults with communication difficulties. "I only started Sign along with us a month ago and the positive response has been overwhelming, lots of people are copying the signs and schools showing them in assemblies." Debbie Thomas from the National Deaf Children's Society said parents faced a "postcode lottery". She added: "We feel that the Welsh Government has a responsibility to make it very clear to local authorities that this is exactly the type of support they should be providing to families of young deaf children, because it's crucial from helping their social development, to helping their educational development." A spokesman said the Welsh Government would be "reviewing the provision of BSL for adults in Wales in the coming months. This work will determine the costs and demand for delivering BSL and will help develop a fairer and more equitable system".